Cherry cultivation is one of the most complex and delicate crops. Like other fruits such as kiwi, peach or plum, it can suffer important negative effects from excessive rainfall, increasingly common in the season of fruit ripening (starting from the second decade of May). 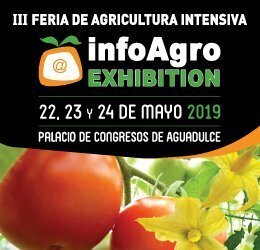 Leading international player in the technical textile sector for agriculture, Arrigoni proposes new solutions that improve cultivation practices. Moreover, it combines the possibility of protecting crops from the attack of harmful insects, such as the dreaded Drosophila Suzukii and other species to the advantages of defense against atmospheric agents. “Until now – explains Giuseppe Netti, agronomist from Arrigoni – damages of rain on cherries was prevented by means of plastic film covers. In several cases this solution produces satisfactory results. However, it is not 100% effective. This is due to the fact that a totally “waterproof” product reduces the air passage (which remains only in the horizontal direction) and favors a moist environment on sunny days, altering the microclimate of the orchard and causing an excess of humidity. Consequences are damage or reduction of the harvest. Moreover, such a cover can cause serious damage to the structure in the event of strong winds”. “Arrigoni research has thus developed a specific innovative product: PROTECTA®. This is a new concept of coverage – Netti continues – which guarantees multiple advantages: reduction in the percentage of water flow; maintaining sufficient air flow and a good microclimate; high mechanical strength; long life (over 6 years in Italy); hail, wind, frost and sun protection”. PROTECTA® by Arrigoni is made of high tenacity ARLENE HT® monofilament and contains special additives to increase its durability and favor the sliding of rain outside rows. The resulting mesh fabric is very dense (39 threads per square centimeter), which allows to break up the drop and reduce the passage of water by about 90%. “The tests on PROTECTA® – Netti specifies – were carried out by subjecting the fabric to a very high rainfall intensity: 60 mm/h, or the same conditions as a heavy downpour”. 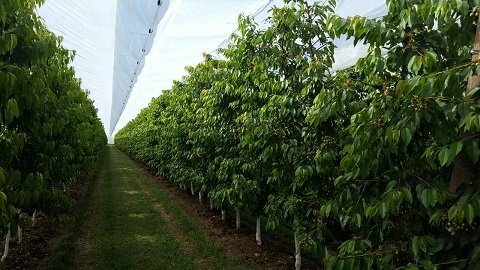 To combine the advantages of a safe rain protection with those of excluding the most invasive insect species from orchards, Arrigoni has also developed PROTECTA® SYSTEM. In this case, the rainproof fabric is complemented by the side protection provided by BIORETE® screens, which are effective in preventing harmful insects from reaching the crops and causing damage in fruit-growing. The insect protection system consequently reduces the need for pesticides, with solutions that manage to counter the attacks of Drosophila Suzukii and other harmful insects. “To these highly technological proposals – concludes Netti – we combined great ease of installation and collection operations. For example, with PROTECTA® SYSTEM installed row by row, BIORETE® screens must simply be rolled up, otherwise the plants are always sheltered and protected”.